A little detour to the Arts & Crafts corner of my world. 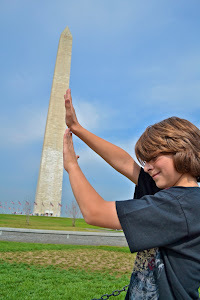 I will be posting fun ideas for families to inspire creativity here and there. 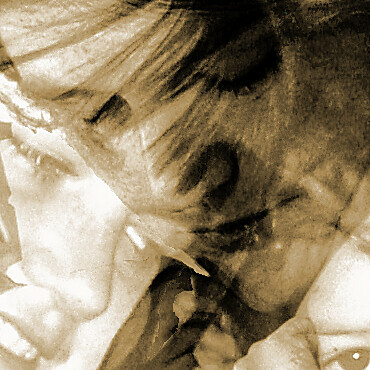 Our house explodes with imagination and artistic expression ergo the post Creative Mess. 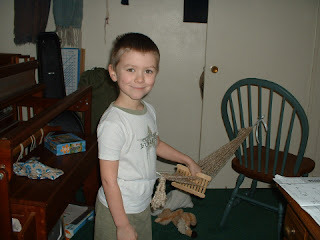 Toady is Kids Weaving 101: Adult supervision needed. A) Take the small craft sticks and punch or drill holes in the center of each stick. B) Glue the 11 small craft sticks onto 2 of the Larger ones creating a box shape. Leave plenty of space in between each stick. C) Glue the last 2 remaining Large Craft Sticks to the exposed side of the smaller sticks. Now the front and back has the Large Sticks covering the ends. 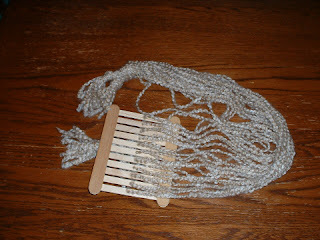 D) As the picture shows thread each strand of yarn through a hole or slat. 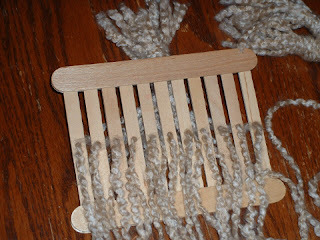 Example one through hole, next strand through slat and so on until each is threaded. Tie off each end. E) With an extra piece of yarn tie one end to chair and one end to child. 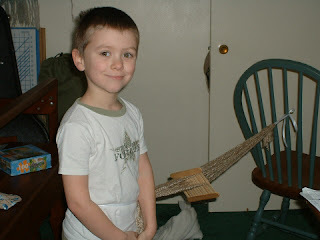 Have your son/daughter pull the yarn tight without pulling the chair over. To Weave simply pull the loom towards you. Pull up or push down to create the path to weave your skien through. Alternate up and down as you weave. Pull back on the loom to push the woven yarn tightly in place. Have fun and don't get frustrated. Weaving takes time and practice. I'll have to show this one to Scarlett. She's very, very artsy-fartsy. While reading this morning, I felt the Lord wanted me to remind you of this verse: Acts 13: 50-52. :) See you soon. What a great mom you are!!! Bless you as to raise up warriors for Jesus!! 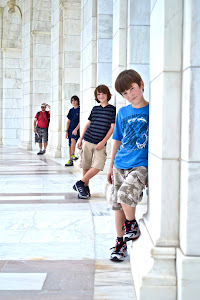 I am a mom blessed with 3 boys and I am married to an amazing man. I am real, honest & open about my life. I love that God made me dramatic, crazy, glamorous & a smattering of hippie to boot.I have decided to chronicle my journey of going back to school as a mom and the adventures that pop up on the way. I Took the Car Test TOO! What do we do on Snow Days? Have Fun of Course! Who Will Marry My Drama King? Do You Ever Go To La,La Land?